All of our fabric lamp shades are hand-crafted with pride, and made in the USA. Our lamp shades come in a variety of shapes including: round empire flares, standard round empire, oval empires, drums and pendant lamp shades. Sizes range from 6 inch lamp shades to 18 inch lamp shade sizes. 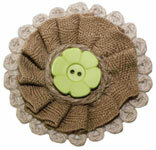 We also offer magnetic burlap accessories to dress up any lamp and candle sleeves to add a seasonal flair to candles.